Kim Kardashian has shilled for a wide variety of different products, including diet pills and Silly Bandz. But her recent promotion of a morning sickness drug on Instagram, Twitter, and Facebook has gotten her into some hot water with the FDA. 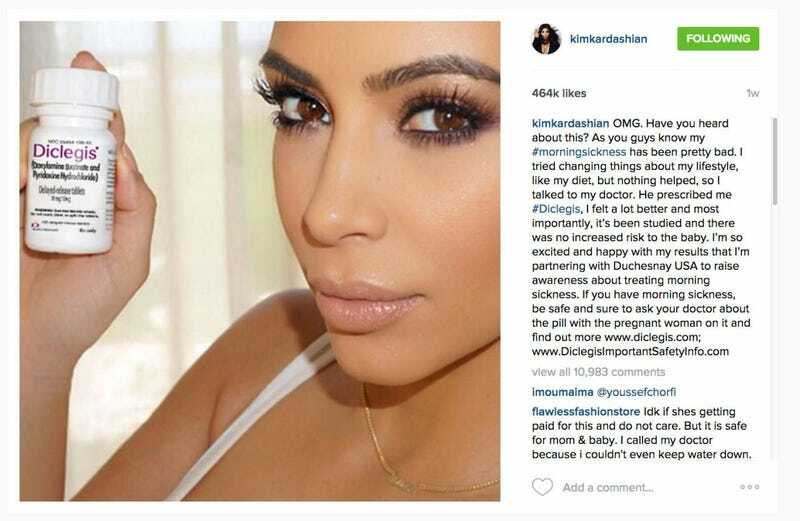 On July 19th, Kardashian posted about a morning sickness drug called Diclegis, made by a drug company called Duchesnay. But the FDA now calls Kardashian’s posts “false and misleading” because they omitted “all risk information.” Could we soon see the days when your Instagram ads include the social media equivalent of those hilariously long side effects warnings on TV? As you might have guessed, “partnering with Duchesnay USA to raise awareness about treating morning sickness,” was another way to say that she was getting paid gobs of money to rave about the drug. Kardashian’s promotion of the drug was eventually pulled from Facebook and Instagram, but not before the endorsements were picked up by numerous websites like E Online, where there was no clear indication that Kardashian’s promotions were advertisements. Buying a celebrity promotion on social media from Kim Kardashian is rumored to start at somewhere north of $20,000, but advertisers love to get “organic” coverage from celebrity endorsements after the fact when the message ripples through the new media ether. The drugmaker was previously warned by the FDA about misleading statements involving its morning sickness drug in 2013. The FDA has demanded that Duchesnay immediately cease its “misbranding” of the drug and has until August 21st to respond to the agency. Any ruling against the company will likely include a stipulation that Kardashian issue a new statement on social media about the drug. Which, absent any potential fines, must seem like a buy-1-get-1-free deal from the perspective of the drug company.